The perfect latke is crispy on the outside while hot, soft and fluffy in the center. Savory latkes should be aromatic and salty, oniony and delectable. A well made latke is nearly impossible to resist. In the 15 years I have been making latkes, none have turned out more delicious than these Crispy Panko Potato Latkes. The secret? It’s a combination of using the proper preparation method along with light, airy panko breadcrumbs. During Hanukkah, it is Jewish tradition to eat foods that are deep fried in oil (learn more here). Once a year, we are given guilt-free rein to enjoy fried foods like potato latkes. Over the past several years I have made hundreds and hundreds of latkes for the holidays. During that time I have managed to learn quite a bit about what works and what doesn’t in a latke recipe. Forget the calories and fat. If you’re going to make latkes, indulge yourself and make them the way they were meant to be enjoyed… fried, salted and devoured. When it comes to making a hot, crispy, fluffy, delicious latke, there are many schools of thought. Some folks like to fry their latkes in olive oil. Others use “liquid gold,” schmaltz– aka chicken fat– to fry the latkes. There are those who say that you must add garlic and seasonings to give the latkes flavor. Others believe in the basics– onion, salt and pepper. Then there is the question of size– some like large, flat latkes and some prefer small, crisp, hash brown-style treats. Some use matzo meal to bind the latkes, others use flour. And then of course, there are the toppings… applesauce or sour cream? Some will even top their latkes with ketchup– blasphemy! Don’t worry, I won’t judge you. 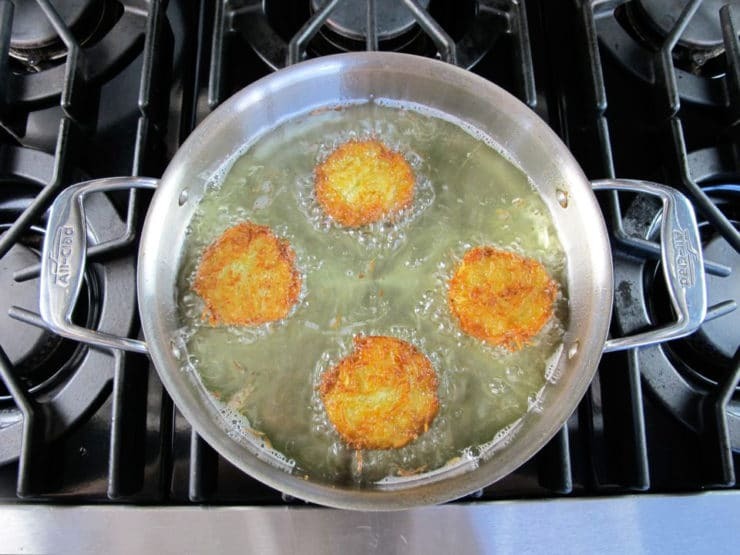 Whatever floats your latke boat. It’s all good! I generally use grapeseed or peanut oil for frying– each has a high smoke point, making them ideal for deep frying. Sometimes I’ll add a few tablespoons of schmaltz to the oil to give it a schmaltzy flavor. 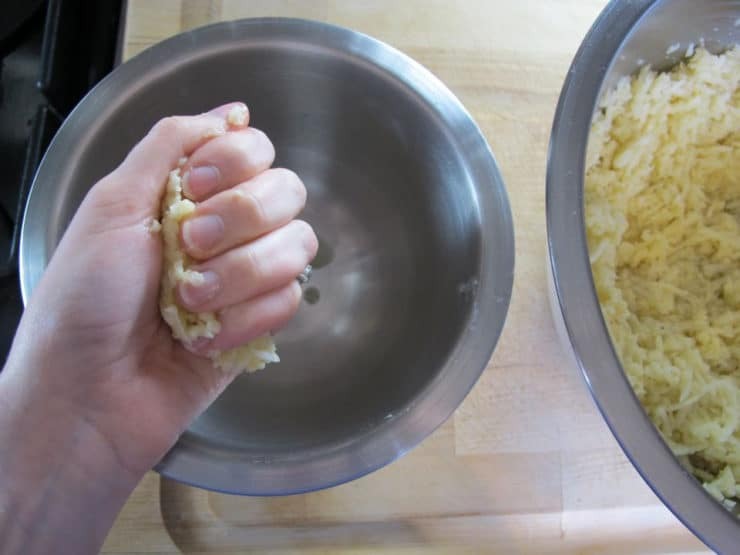 I use fine potato shreds, rather than large ones, which helps the latkes to hold together better. I squeeze the heck out of the potato and onion shreds to remove as much liquid as possible. I also add some potato starch to the mix, which helps bind the latkes without making them gummy. And I always drain them on a wire cooling rack… this keeps them from sitting in their own oil and getting soggy. Recently, I decided to use Japanese panko-style breadcrumbs as a binder for the latkes, instead of matzo meal or flour. I loved the resulting latkes– they were golden brown and super crispy, while perfectly light and fluffy inside. Panko has the ideal texture for holding these bad boys together. Follow the steps in the recipe carefully, and you are sure to end up with a seriously delicious plate of latkes. Chag Sameach! Need more latke tips? 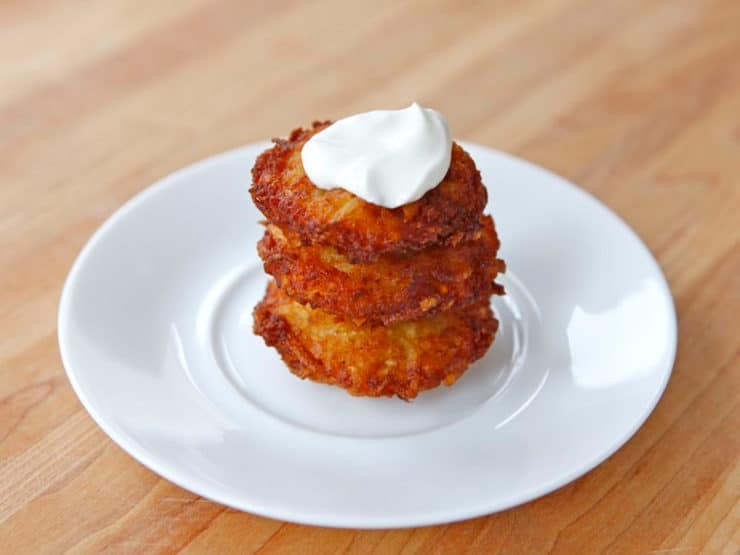 Check out this post which covers all of my latke advice in-depth. Looking for a gluten free potato latke recipe? Click here. 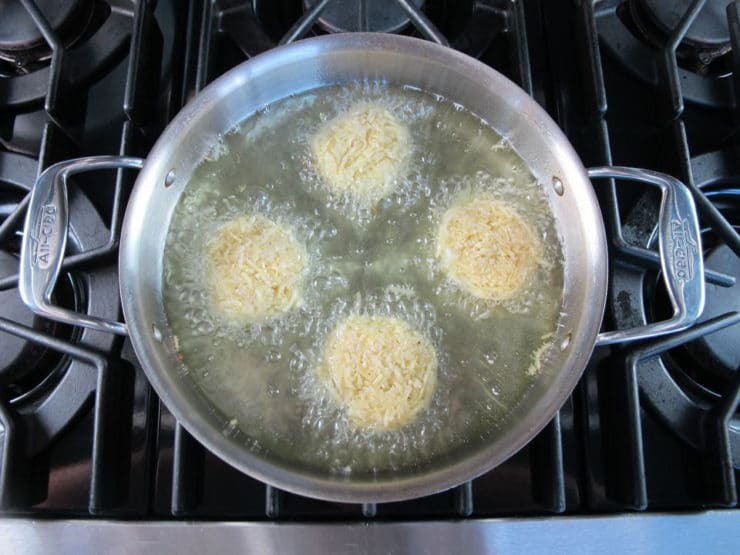 What is your favorite way to make latkes? Are you an applesauce or sour cream aficionado? Share your own tips in the comments below! Perfectly crispy panko potato latkes with a fluffy, flavorful center. Step-by-step tutorial and cooking technique with photos. Hanukkah, kosher. Peel the potatoes, then grate them using a hand grater or food processor shredding attachment with fine holes (small shreds). I really recommend using the food processor, it saves a ton of time and will help you avoid onion tears when grating the onion. Pour oil into skillet to a depth of 1/8 inch. Heat slowly over medium to about 365 degrees F. While oil is heating, use the fork to stir the panko breadcrumbs, beaten eggs, dry potato starch (optional), salt and pepper into the potato shreds. 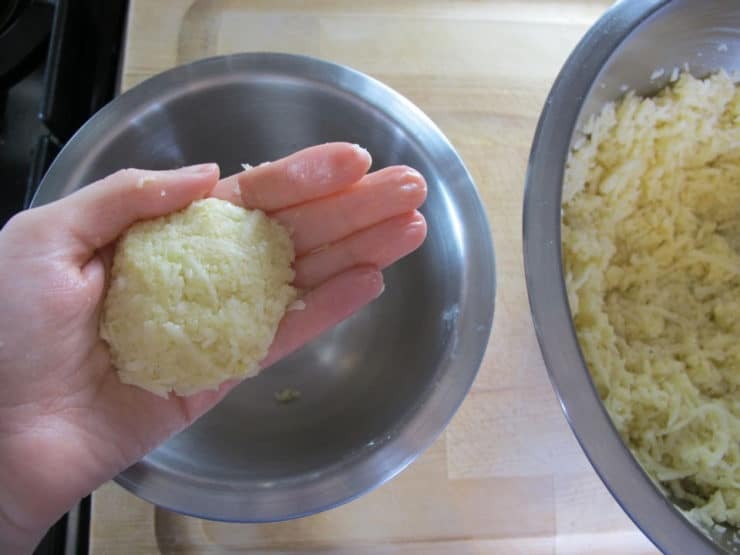 The dry potato starch helps to hold the latkes together, but it's not required. Add salt and pepper to taste. I add about 3/4 tsp of salt and a 1/4 tsp of pepper. You can sprinkle on more salt to taste after cooking, if desired. Take care to make sure the egg and seasonings are fully mixed throughout the potato shreds. Scoop up 3 tablespoons of the potato mixture. I do this by using a 1/4 cup measuring cup and filling it 3/4 of the way full. Squeeze the mixture firmly in your palm over an empty dish to remove any excess liquid (if you squeezed the potatoes out thoroughly in the cloth, you may not have much excess liquid to squeeze out). Shape the potato mixture into a tightly compacted disk. 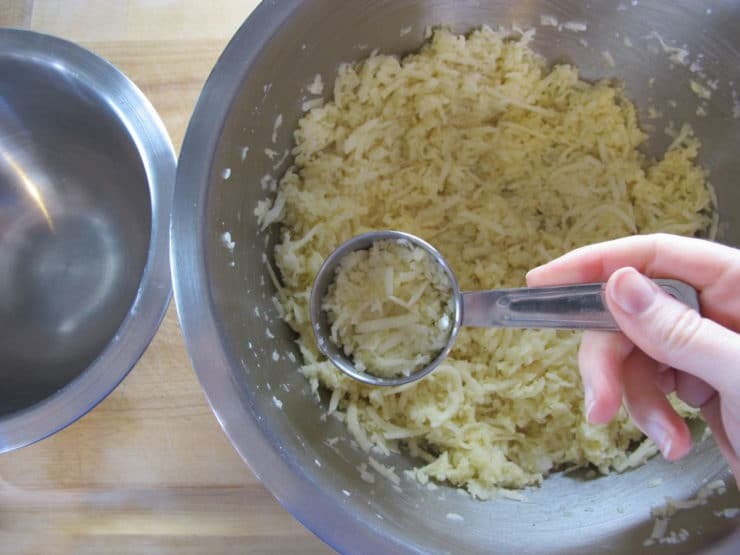 Continue shaping the latkes in this way, using 3 tablespoons of potato mixture for each latke. Fry in batches of 4-5 latkes at a time (no more than that-- don't crowd the pan) for 2-3 minutes per side till brown and crispy. Note: If your latkes aren't holding together, stir more potato starch into the mixture, 2 teaspoons at a time, till the batter "holds." You can also add another egg to the mixture and more panko, if needed. Remove the latkes from the pan using metal spatula and place them on wire cooling rack to drain. I recommend serving latkes fresh within 10 minutes of frying them, if your cooking schedule permits. If you need to make them ahead, fry them 4 hours or less before serving. After letting the latkes drain on the wire cooling rack, place them on an ungreased, unlined cookie sheet. Leave them at room temperature till ready to reheat. Place in a 375 degree oven for about 10 minutes (7 if using a convection oven), until heated through, just prior to serving. Serve latkes with applesauce and/or sour cream, if desired. Oh so yummy! A former boyfriend’s mother, Shelia, made these for me ages ago & I was not able to duplicate them. This recipe is it! You brought back wonderful memories! My latke aren’t as round, but the shreds up crisp extra so it was a treat. Didn’t have potato starch, so I used half potato flakes half corn starch. I did have to add another egg & a bit more Panko. It does take a gentle touch. I’m so glad I read though all of the recipe & tips. I make panko from matzo. Crumble the matzo and add to food processor. Just a few pulses to make the matzo like original panko and presto, you have panko. Love this recipe! Because we like to eat at the same time as our family, we prepare the latkas a few weeks in advance. We have made what we think are improvements. First, we buy already shredded hash browns in the frig section of the market. We shred them a tich more using the food processor. Follow the rest of the directions as written. Second, as soon as the latkes have cooled on the wire racks, freeze them. Do not layer them. Once frozen you can stack and store them like cookies. When we are ready to feast, we heat the oven to about 425. We reheat and recrisp the latkes on wire racks, over sheet pans till sizzling hot. No need to turn them. Can’t remember how long it takes but you’ll know. I “stand by” for the first batch. In my double oven, I can serve up 36 latkes at a time. Everybody is happy! Last summer I found a batch in my freezer. I promise you, they were just as good. I am Belle, and I am studying Judaism at school. We get to make a traditional Jewish recipe, write about the culture behind it, and also about the science. So far, your website has been so helpful with the two first aspects. Thank you so much! 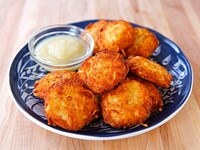 I would love to make these latkes-they look really good! Since we have a time limit of 1 and a half hours, I was wondering how long it would take to grate the potatoes for 50 latkes (It’s for a cultural fair) by hand. As a side note, what are the differences between the Crispy Latkes and the classic ones? Which one do you recommend? Hi Belle, what a cool project. Grating by hand can take a lot of time, so I suggest getting some helpers to grate along with you if going this route. As for toppings, the most traditional would be sour cream, applesauce, chives, and/or smoked salmon (not grilled). Never bacon, as pork is not kosher. Also you would only use sour cream in latkes made without chicken fat (schmaltz), as kosher law prohibits mixing milk and meat together. The Crispy Panko Potato Latkes use panko breadcrumbs, which are a modern adaptation – panko is Japanese, but it works really well in these latkes to make them light and crisp. For a more “traditional” Jewish latke, the classic ones are the way to go… but both are delicious. 🙂 Enjoy! We made the latkes and they were our best ever !! Now we would like to buy the beautiful blue plate in the picture. Where I’d you buy it or it or do you sell it. Hi Audrey! This plate came from Pottery Barn, it was part of their Hanukkah collection a few years ago. Not sure if they still sell it! Hi there. I’ve seen VERY similar plates at Hobby Lobby & many times they go on sale. Just saw them for 50% off. Very affordable. Hope this helps. I offered to make latkes for a friend who had never had them, but when I got to the part where I add the matzoh meal, I realized I was out! I used panko. They came out amazing! And, now, later the same evening, I stumble upon this recipe. Kismet. You produce a great site with equally great recipes. Looking to make a test batch of these. Woud you be able to add a photo of your shredding blade attachment with the “fine” holes? That would be helpful if you can since that part seems important to the success of the recipe. Hi Syl! Either shredding attachment will work. After making these for many years now, I’ve come to like them both ways – with big shreds or small. Just use the attachment that looks like a cheese grater (many grater holes on the disk)– most attachments will have big holes on one side, small on the other. Use the small hole side to make finer shreds. Hope that helps! Hi Tori – your recipe is it. I’ve been trying different recipes for rosti and latke and there’s always something not quite right – some are far too simple and some are too complicated. 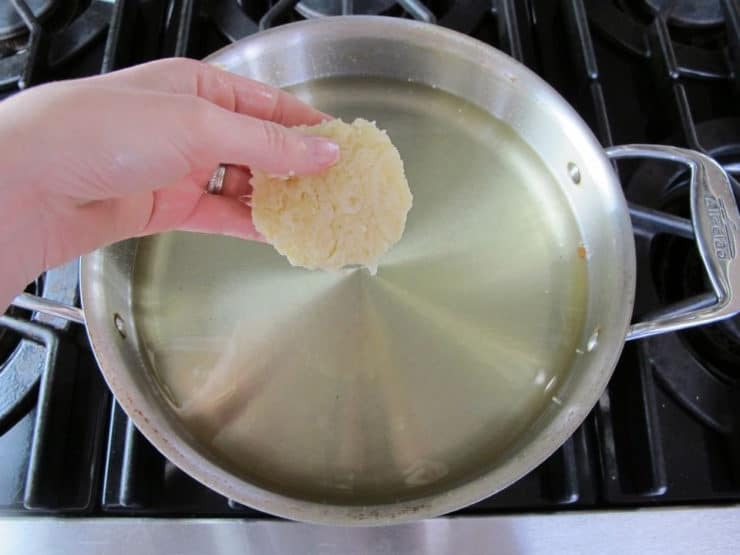 I love your cook’s tips – they are so useful and informative – and this recipe is simple and does the trick. I make food for a lovely old Jewish lady when she has little gatherings and they couldn’t believe how delicious my latkes were! I served them with smoked salmon and cream cheese mixed with lemon juice and pepper – simple and delicious. You’ve changed my life. No really! I also modified the recipe to make beetroot latkes with caramelised onion, goat’s cheese and thyme. I found you randomly on the net, I will start following you now! I have to make latkes for my son’s preschool class. I won’t be able to serve them within 4 hrs, but will have to reheat them the next day. Are there any recommendations for keeping them tasting the best? Freeze vs refrigerate? And how best to reheat them the following day? Thank you so much! Great recipe. My Grandmother always made the best latkes and narishniki(spelling?) for breakfasts actually s we are Polish. I can never get the latkes the same way so I changed ingredients like using meal but, always too soggy, overdone, not patient enough on draining, so fry issues etc. until I ran across the panko idea in Toronto from a Jewish chef. It is perfect and then I found your recipe to make them with, thank you so much. My mother taught me to soak the potatoes is cold water after pealing. Can’t wait to try placing the potato shreds in the cold water; should speed the process up a bit. Hopefully I will be able to have my food processor mess cleaned up before family arrives. Thanks for your tips, always appreciated! 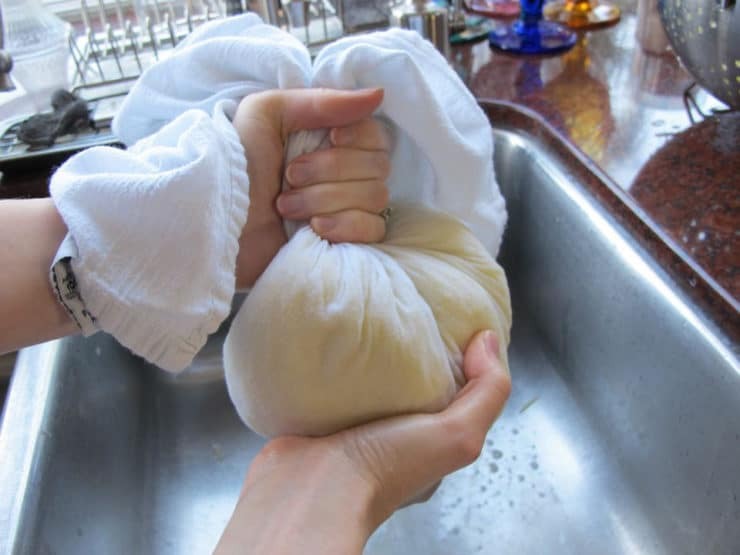 I have always used a potato ricer to press out the moisture in the potatoes versus using a tea towel. I also use the ricer when I have to squeeze out moisture in frozen spinach… Works like a charm. Thanks so much for your recipes and the amazing history lessons! Hey Tori-I was cruising the net for a Latkes recipe when I found your site and noticed a number of people had trouble finding potato starch. If your’re squeezing water out of potatoes you have potato starch! Squeeze the potatoes into a bowl, let the starch in the liquid settle to the bottom and simply tip to drain the water off. Vio la! Potato starch! How much do you use? What ever is in the bottom of the bowl! Love your site and will be making your Latkes soon. As a Goy I don’t have to wait for Hannakah. And they are great with Hebrew National Knockwurst-steamed. Maybe a little sweet and sour cabbage….it’s the simple things in life, isn’t it? 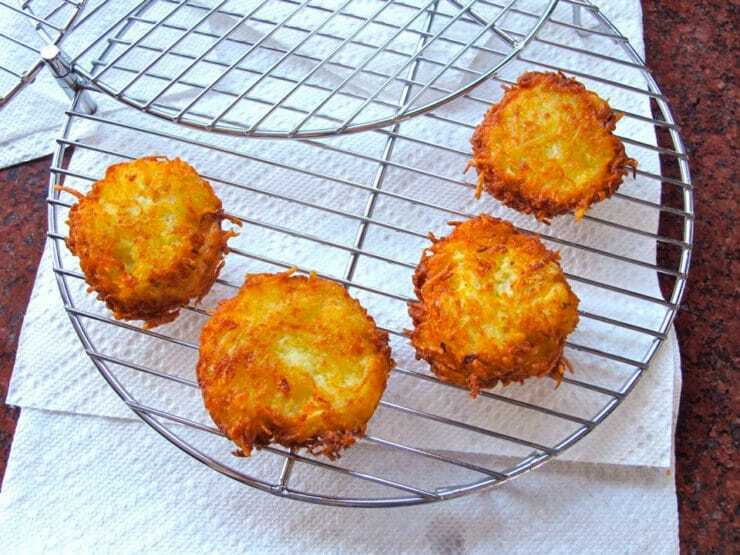 Yes JohnInNC, it’s a great tip which I shared in this post: http://theshiksa.com/2013/11/27/how-to-make-crispy-latkes/ enjoy the latkes! These are, by far, the most delicious latkes I have ever eaten! The panko/potato starch combo is perfect and draining them on a cookie rack over paper towels – brilliant. Thanks, Tori and Chag Sameach! Place all ingredients in medium saucepan. Bring to a boil. Reduce heat and simmer, covered, stirring occasionally, for 20 minutes or until apples are soft enough to mash with a fork or potato masher to desired consistency, smooth or chunky. Thank you for this recipe and your website! I made a double batch of these latkes last night for my Temple’s 20s & 30s group. They turned out perfectly! And I felt like a cooking rock star with your excellent tips and suggestions, especially as I wowed them with the food processor. All of your recipes are guaranteed to be clear, concise, and easy to follow. I really appreciate it! Wow! This fried up so crisp and pretty. I did leave the skins on and it didn’t seem to make a difference. I have to make about 200 for a large party this year. Do you have a recommendation for freezing and reheating? Hi Samantha, while I much prefer making latkes fresh, when you have a large party like that it is kind of tough to do. Fry the latkes golden brown. Once they have drained of oil, place them into a sealed freezer bag or Tupperware in single layers separated by parchment or wax paper. Freeze. When ready to reheat, place on an ungreased baking sheet in a 400 degree oven straight from the freezer until heated through just prior to serving (it will take 10-15 minutes). I have always been leery about trying to make latkes myself and have often settled for the box mixes or going to one of our local delis and purchasing them. Thanks for all the great tips it’s going to be hard now to reserve this just for Hanukkah. I just made these last night ( we had to start Hanukkah a little late this year because hubby was out of town for work) and they came our perfectly! Thank you so much for the detailed, step by step instructions. Loved the pictures too. I usually dread making latkes but your instructions helped ease my angst. This Shiksa will not fear them next year 🙂 Mahalo from Honolulu! Hi Jessica– I’ve never measured it by the cup, only weight, so I’m not sure. Tip for drying potatoes – use a salad spinner. You can dry in a towel as well but the spinner does most of it. the best latkes ever! I made it for the seventh nigth. Love the panko and potato starch. They came out perfectly! Thanks for share! This looks like a great recipe. 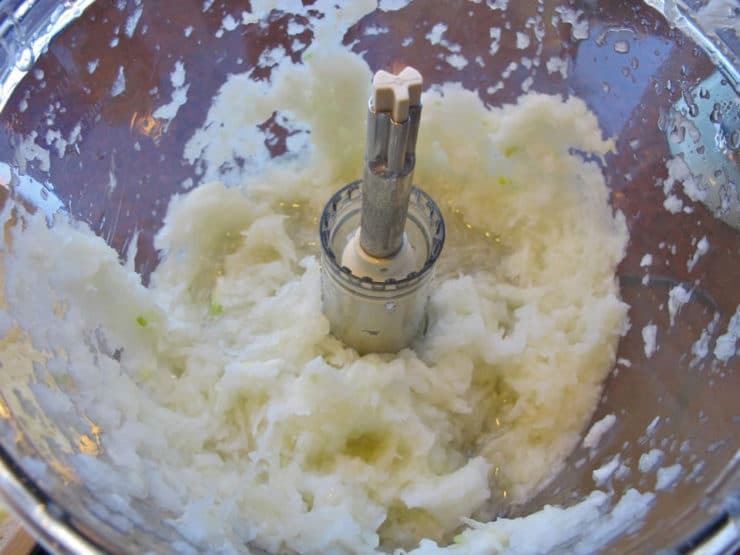 One suggestion that I’d like to contribute is that instead of using a towel to remove the excess liquid from the potatoes, try using a potato ricer. I’ve been using one on the potatoes that I use for hash browns for years, and it really does a great job. It is important though to just use the ricer to compress the potatoes (and onions in this recipe, I suppose) to squeeze out the moisture- I’ve heard tell of somebody that wasn’t clear on that particular instruction and they ruined their ricer by trying to force raw potato out the holes… As a Goy, I haven’t had latkes since grade school, but I look forward to trying this recipe! Oh, and as I recall, I was a fan of the sour cream as a condiment. Yes, THE best latkes I too have ever made! The one tip I can pass along is to make sure you really get out as much of the water from the potatoes as you can before frying them. This is certainly one for the recipe box to keep hold of for easy access. Thanks Tori! Best latkes I’ve ever made. They were soft, light and just scrumptious. Thanks, Tori! You don’t disappoint. These latkes look so crispy and fluffy! Yum…and I like to eat mine with sour cream AND apple sauce. I’ve always used flour in my latke-making, but definitely willing to change it up and try the panko! These look gorgeously golden brown! Donna and I love your step by step photos and directions ,too bad all can not be saved in recipe box. Your recipe sounds amazing and will want to try it with the Panko crumbs… always wondered about those. My question is: if you’re going to squeeze the liquid out with a cloth, why do you bother rinsing it in water? To me that just seems to add more liquid, while washing away the flavour, especially since you’re going to put the potato starch (or other binder) right back in since you want the ingredients to stick together. Made mine this way the other night & they were yummy I have to say. The water is used to keep the shreds from turning brown. It also lends a crisper texture to the latkes. 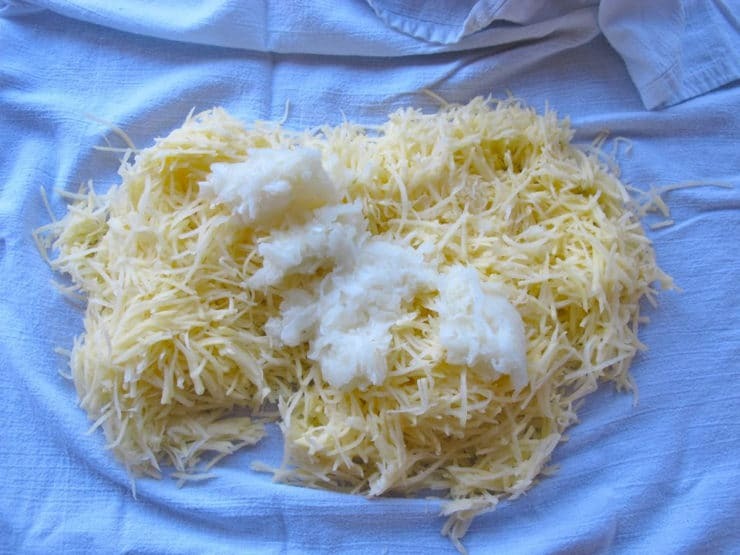 Made these tonight – used white potatoes, hand grated and squeezed out what I could. Fried them in grapeseed oil …we loved them! Do you use dried/crispy Panko Crumbs? I know it’s a little late to ask this as I’m ready to make them now, but your pictures look like you used a lot more than 1/8 of a teaspoon oil! Are my eyes deceiving me? I’ll use your recommended amount and see how it goes. Gotta run, my family is coming for lunch. Oh, by the way, a new family tradition at my house is Leite’s apple fritters, not sufganiot. If you’ve never tried them, do! They are fantastic! Chag Sameach! Hi Gaby, you misread the instructions. Pour oil to a depth of 1/8 INCH, not 1/8 teaspoon! You can use the wire rack of your microwave! we don’t have potato starch here. Should I use normal starch? Hi Alexan! As I mentioned to a reader before you, go ahead and make them without the starch. If you find your latkes are crumbling and not holding together well, you can add more egg and panko. You can also use flour as a sub for the potato starch, though I like the consistency of the starch better. 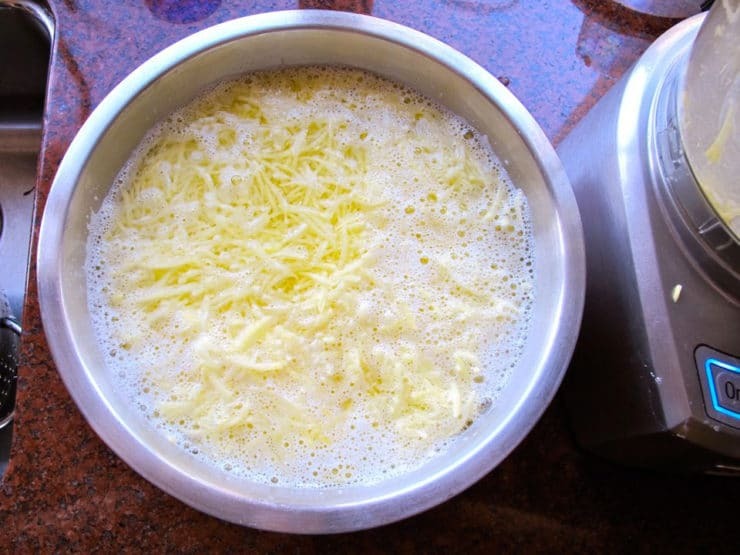 Also, when you drain the potato shreds, drain them slowly you’ll notice a milky white substance has collected at the bottom of the bowl where they soaked. That’s potato starch. 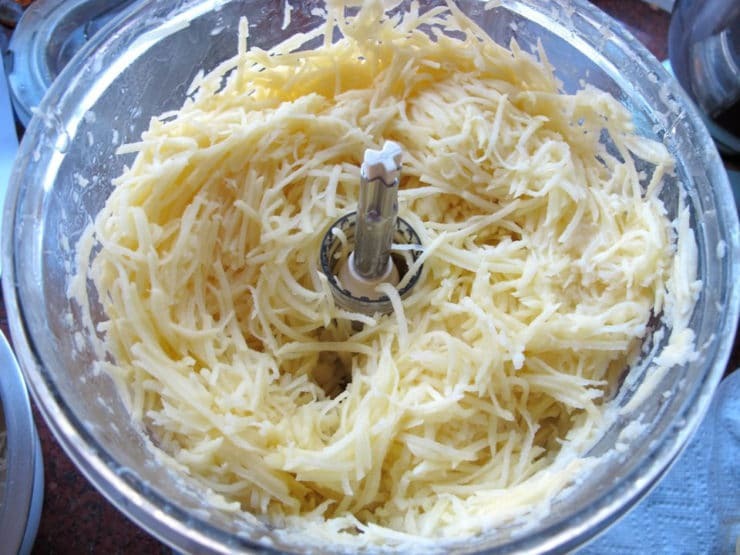 Scoop it up with a spoon and throw it into your potato shreds, it should help the batter “stick.” Good luck! I first need to commend you and your blog. I stop by occassionaly. Today, I originally stopped by to check out your Hannukah fritters and then latched onto this recipe. (though I may need your forgiveness, I am not Jewish, yet I have deep respect for tradition and foods) I intend to try your fritters for a lovely Sunday brunch along with the latkes with eggs on the side. Have a wonderful day. Now off I go to check out your shop. Totally worth it. There won’t be many leftover, promise! Use Greek yogurt, the thick rich flavor will work perfect. Enjoy Ilke! Loved watching you on TV this morning and your sense of humor at calling yourself a shiksa. A very beautiful one at that! I also used a tablespoon of lemon juice to stop the oxidation and browning of the potatoes. I made then last week for fun, with an Italian twist, using parmaesan cheese and chopped basil in the mixture. They were delicious. I will definitely try them with panko crumbs since I use them a lot for my Chicken Schnitzels. So sweet of you Laureen, I’m happy you caught the segment! The Italian version sounds awesome. My friend from Mexico also makes a version with cheese, she’s going to teach me soon. Can’t wait! I am definitely going to try mine this way. I love crispy latkes with sour cream and sometimes a little horseradish. I usually stick with traditional potato latkes but I do like spinach and leek latkes. I live in London and would like to make your Latkes but what are Panko crumbs? Hi Brenda, click the link in the blog above and it will take you to my market so you can see what they look like. They’re basically Japanese-style breadcrumbs (the same you would use for tempura), but they’ve become more mainstream recently and can be found in most American markets next to the regular breadcrumbs. If you have trouble finding them, try a Japanese market, or you can substitute regular breadcrumbs if you like. Enjoy! I haven’t made latkes in ages and I am embarassed to admit that I only used the Manischewitz boxed mix. I cannot wait to try this recipe. However, I have to say, after printing this recipe out I said, “This better be good because I’ve never cooked anything that had 3 pages to the recipe before.” I say this in jest because I’m dying to cook some of the wonderful things I grew up eating as a child. Hey Susan! Just FYI, the recipe prints long because I tried to be VERY detailed with the process. The more details I include, the less of a chance somebody might go wrong. It’s really not a very complicated recipe. Enjoy! HELP – I need recipe for gluten free potato latkes and would also like recipe for sweet potato (yams) latkes. My daughter tasted them somewhere and said they were really delicious. These look amazing. 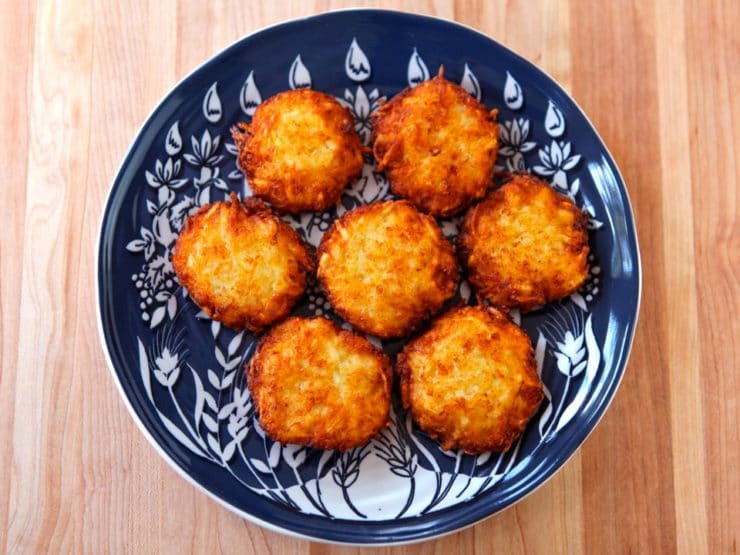 I have never made them myself…and dare to say I have probably never had a truly delish latke. Might have to give this a whirl this season. And oh yeah I prefer applesauce! Looks yummy, thanks for the tips!! To keep the potatoes bright white, I add some crystal vitamin C (sold at Trader Joes and health food stores) to the water in which I put the grated potato. Cover with a paper towel and sprinkle some more of the Vit. C on. It will keep in the fridge for more tha a day. Love the panko idea! For the potato starch, I acutally save the liquid I squeeze from the potatoes and onion. That liquid is mostly water, but there’s also quite a bit of starch from the potatoes. Just drain the water, and add the potato-flavored starch! Forever. Looking forward to using the Panko crumbs. These look amazing. I love the idea of Panko as the binder. I always make Yukon Gold potato latkes. I think I’ll be making these next weekend. These will work great with Yukon Golds, Leah, and you won’t have as much of an issue with browning. YG’s naturally have a bit less starch, though, so add more potato starch if you need to keep them from falling apart. Enjoy! Love your blog and try things here and there. I want to make these Latkes, but I can’t find Potato Starch. I went to 2 main stream supermarkets. Nothing! Looked in the baking and ethnic food sections. Where can I find it? Hi Craig! Sorry you’re having trouble. It’s easier to find at Passover, though it is becoming more widely available now that so many people are going gluten free. Did you check the kosher food section? If yes and still no luck, then go ahead and make them without the starch. If you find your latkes are crumbling and not holding together well, you can add more egg and panko. You can also use flour as a sub for the potato starch, though I like the consistency of the starch better. 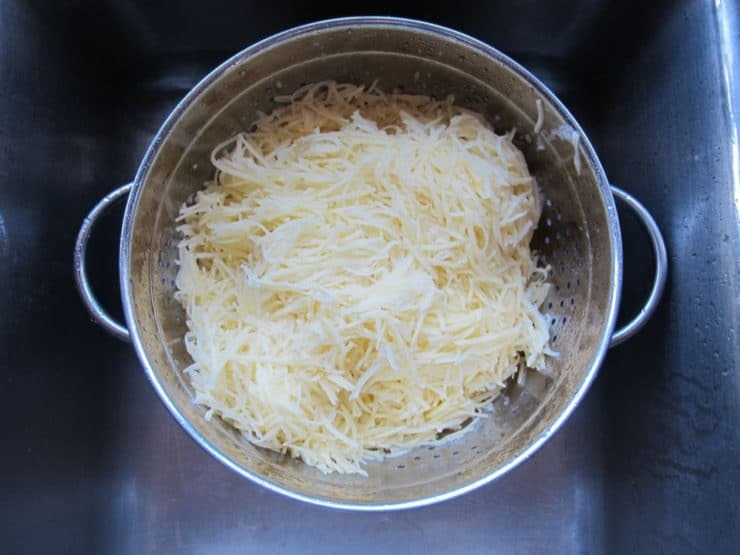 One more note– when you drain the potato shreds, drain them slowly you’ll notice a milky white substance has collected at the bottom of the bowl where they soaked. That’s potato starch. Scoop it up with a spoon and throw it into your potato shreds, it should help the batter “stick.” Good luck! This looks like the most efficient and tasty latke recipe ever. I’m definitely going to try it – though, sadly, I don’t have a fancy enough food processor for that tip. I have a little one with no attachments. But I have a mandoline that will work just fine, if a little more slowly. I love that blue plate in the main pic, too. You always have the prettiest serving plates and bowls! Hi Stella! 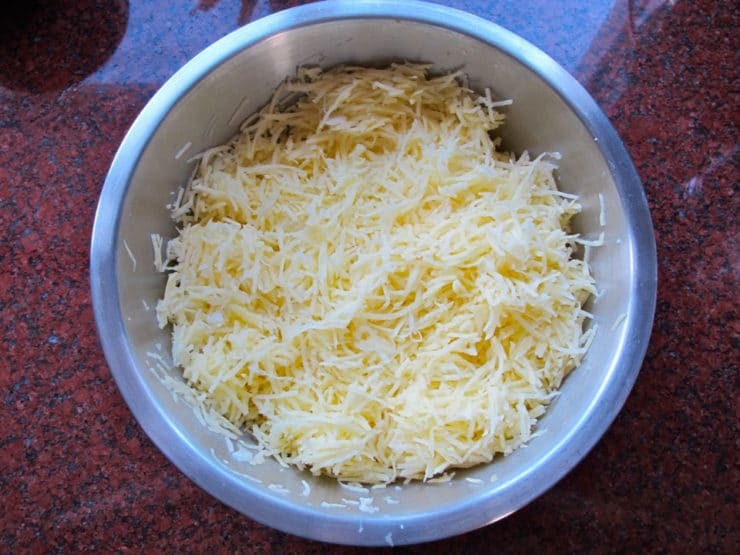 If you’re hand grating, make sure you grate the shreds directly into a bowl of water, or transfer the shreds to water frequently, to eliminate browning. Good luck! Thanks for the tip, Tori! Your latkes look like the best I have ever seen! What a great idea to use panko. I can’t wait to try these! I’ve been making latkes for 40+ years, and have never thought to make them this way. I can’t wait to follow all of your tips. I am sure my family will be thrilled at the results–they expect latkes every night of Hannukah! By the way, even though I don’t comment on all of your posts, I do read every one, and have tried a number of your recipes. Yum!! Instead of using orange juice, a chef suggested a Vitamin C table. It works just fine! I love your cooling rack! May I ask where that is from? The main thing I like about these racks is that they’re stackable and don’t require a lot of counter or storage space. If I had to do it again, I’d buy one of these. The rack I have currently needs to be spread out into thirds… a stackable would save me a lot of precious counter space. Hope that helps! Thank you SO MUCH for sharing this recipe. I’m so excited about these. Can’t wait to make them!! I’ll have to wait, though, because we have to go to Kiev for the weekend. 🙁 When I get back, this is gonna be my first meal. 😉 Enjoy your weekend!! ttyl Thanks, again!! I found a way to prevent a latke mixture from turning weird colors(you know…. the pink/brown/gray transition)-I soak my potato shreds in water w/a little citrus juice (approx. 1-2 tbsp. per quart) to prevent oxidation of the potatoes’ starch. I can’t wait to try latkes with panko-sounds like a great solution to the dreaded “soggy latke”. Hag Sameach! Great tip Tamar! I usually don’t have a problem with greying/browning if I put the shreds directly into the water, but the lemon juice certainly wouldn’t hurt. 🙂 Chag Sameach to you, too! Thanks so much for the panko tip. I will try it this year. Since we are usually traveling in the sunny SW during Hanukkah, I prepare latkes in my motorhome kitchen… so I cheat (shhhhh) and use already-shredded potatoes (Simply Potatoes brand). I like ’em crispy and small, and top them with a bit of creme fraiche, lox and fresh dill.